In 1960, American physicist Freeman Dyson proposed the idea that an extremely advanced—and power-hungry—alien civilization could, in theory, harness the majority of their host star’s energy by building a vast structure around it to absorb its radiation. Scientists in the field of SETI (Search for Extraterrestrial Intelligence) have carried out a number of searches for such structures, known as Dyson spheres—which could be constructed using material harvested from dismantled planets—without uncovering any compelling evidence for them. Now, in a paper published in The Astrophysical Journal, researchers from Uppsala University, Sweden, and Heidelberg University, Germany, have proposed a new way to look for Dyson spheres that may have some advantages over previous attempts. Scientists have predicted that the hypothetical spherical structures would block out most of the visible light from their host star. So, efforts to date have focused on finding signs of excess infrared light, Astrobites reports. It is estimated that a Dyson sphere would be heated to temperatures ranging from 50 to 1,000 Kelvin (-370 to 1,300 degrees Fahrenheit), generating infrared light which would have a specific signature that researchers could detect. 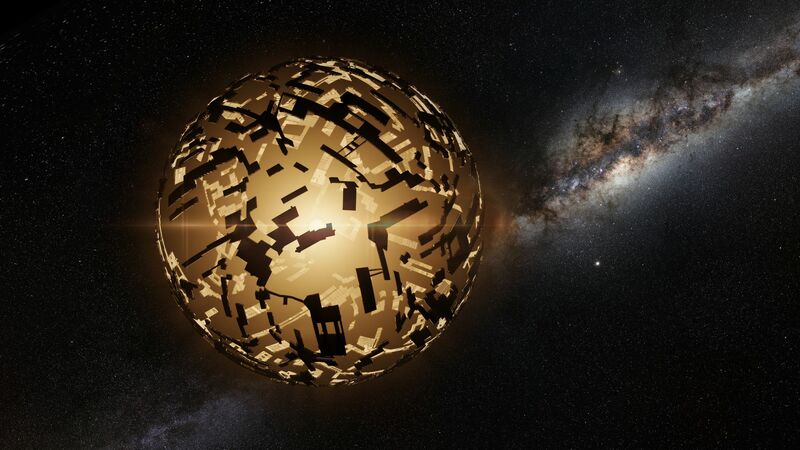 The new paper, however, suggests that a Dyson sphere could potentially be made from a material that hasn’t been considered in previous searches; one that would be capable of dimming the star’s light equally across all wavelengths. This would seriously hamper any search because previous efforts have tended to look for Dyson spheres using an analysis method known as spectrophotometry, which looks at the light properties of stars. If the structure was made of a material like the one proposed in the new study, the observations would show that the star is further away than it is. Instead, the team led by Erik Zackrisson from Uppsala, suggest using another method in combination with spectrophotometric techniques to help scientists identify the hypothetical structures. This “parallax method”—which uses the apparent movements of a target star against the background of more distant stars as the Earth orbits the Sun—is not affected by the kind of light dimming that hinders the other method. The team used both newly released data from the European Space Agency’s Gaia project—which aims to catalogue 1 billion astronomical objects—and spectrophotometric data from the Radial Velocity Experiment (RAVE) to identify distance discrepancies between the two sets of information of the type that are expected to arise if a nearly complete Dyson sphere is present.